1.2 Any changes to these Terms are valid only if agreed in writing between a director of Educonnect and an authorised representative of the Customer. 1.3 Unless confirmed in writing by a director of Educonnect, employees and agents are not authorised to make any representations concerning the Goods and Services. 1.4 Any error or omission in any sales brochure, quotation, price list, acceptance or offer, invoice or other material issued by Educonnect (whether typographical, clerical or otherwise) may be corrected by Educonnect without any liability on the part of Educonnect. 1.5 If there is any conflict between the Order Form and the Terms, the Order Form shall prevail. 2.1 The Customer appoints Educonnect to provide Goods and Services in accordance with the Order Form and these Terms. No other terms will apply to the provision of the Goods and Services. 3.1 The quantity and description of the Goods and Services shall be as set out on the Order Form. 3.2 Each order submitted by the Customer for Goods and Services shall be deemed to be an offer by the Customer for those Goods and Services. 3.4 It is the sole responsibility of the Customer to ensure the accuracy of the terms of the Order Form and that the Goods and Services set out on the Order Form meet its requirements. 3.5 Educonnect may make changes to the Goods and Services in order to conform with any legal requirements or which do not materially affect their quality or performance. 3.6 The Customer shall at its own expense supply Educonnect with all necessary materials and information required by Educonnect to provide the Goods and Services in accordance with the Contract. If a failure by the Customer to provide such materials or information causes Educonnect to miss a deadline, the deadline shall be deemed to be extended by the period of the Customer’s delay. 4.1 Educonnect shall invoice the Customer for the Price upon completion of the provision of the Goods and Services or, if so stated on the Order Form, in stages on the dates and for the amounts specified on the Order Form. 4.2 The Price does not include VAT or any other sales tax from time to time prescribed by law which the Customer shall pay in addition to the Price at the rate prevailing on the date of the invoice. 4.3 If Educonnect agrees to deliver the Goods to the Customer, the Customer will pay Educonnect’s charges for transport, packaging and insurance. 4.4 If, because of a factor beyond the control of Educonnect , the cost to Educonnect of providing the Goods and Services increases, Educonnect may before delivery increase the Price of the Goods and Services. 4.5 The Customer shall pay the Price and all other amounts due under the Contract within 28 days of the date of Educonnect’s invoice (the “Due Date”). 4.6 Should the Customer fail to make any payment in full on the Due Date, Educonnect may charge interest on the outstanding amount. Such interest shall accrue on a daily basis at the rate of 3% above the base rate of Barclays Bank PLC from time to time from the Due Date until the date of payment, whether before or after judgment. 4.7 All amounts due under the Contract shall be paid in full without any deduction or withholding other than as required by law and neither party shall be entitled to assert any credit, set-off or counterclaim against the other party in order to justify withholding payment of any such amount in whole or in part. 4.8 No payment shall be considered made by the Customer until cleared funds have been received by Educonnect. 4.9 The time of payment of the Price and all other sums payable by the Customer pursuant to the Contract shall be of the essence. 5.1 Unless otherwise specified on the Order Form, Educonnect shall deliver the Goods to the Location on the Delivery Date. 5.2 Any dates quoted for delivery of the Goods are approximate and Educonnect shall not be responsible for any delay in delivery of the Goods however caused. Unless agreed in writing in advance by Educonnect, time for delivery shall not be of the essence. Educonnect may deliver the Goods before the Delivery Date. 6.1 Educonnect shall supply to the Customer in reasonable time before the delivery of the Goods such information as may be reasonably necessary to enable the Customer to prepare the Location for the installation of the Goods and to provide proper environmental and operational conditions for the efficient working and maintenance of the Goods. 6.2 The Customer shall prepare the Location at its own expense and provide such environmental and operational conditions prior to delivery. 7.1 Educonnect shall install the Goods at the Location on the Delivery Date. 7.2 If in the reasonable opinion of Educonnect it is reasonably necessary to remove or otherwise disconnect any of the Customer’s existing equipment at the Location in order to carry out the installation of the Goods, then the Customer shall permit, and obtain all necessary consents for, such removal and/or disconnection and shall give to Educonnect all necessary assistance to enable such work to be carried out. 7.3 The time of installation of the Goods shall not be of the essence. 8.1 Educonnect shall, within 21 days after the Goods have been installed, provide such training to the Customer in the use of the Goods as Educonnect (acting reasonably) considers to be necessary. 9.2, the Goods shall be accepted by the Customer and the Customer shall, if required by Educonnect, sign a commissioning certificate acknowledging such acceptance. 10.1 Ownership of any consignment of Goods shall not pass to the Customer until Educonnect has received payment in full of all sums due to it in respect of all consignments of Goods delivered to the Customer. 10.2.6 notify Educonnect immediately if any event specified in clause 13.1.2 to 13.1.10 occurs in relation to the Customer. 10.3 Educonnect may bring an action against the Customer for the amount due under the Contract if the Customer fails to pay it in full by the Due Date, even though property in the Goods has not passed to the Customer. 10.4 The risk for loss of or damage to any consignment of the Goods shall pass to the Customer on delivery. 11.1 Educonnect warrants to the Customer that it will perform the Services with reasonable skill and care. 11.2.2 be reasonably fit for any particular purpose for which the Goods are being bought if the Customer has made known that purpose to Educonnect and it is reasonable for the Customer to rely on the skill and judgement of Educonnect. 11.3.2 Educonnect is given a reasonable opportunity after receiving the notice of examining such Goods and the Customer (if asked to do so by Educonnect) returns such Goods to Educonnect’s place of business at Educonnect’s cost for the examination to take place there. 11.4.3 the Customer alters or repairs such Goods without the prior written consent of Educonnect. 11.5 Subject to clauses 11.3 and 11.4, if any of the Goods do not conform with any of the warranties in clause 11.2 Educonnect shall, at its option, repair or replace such Goods (or the defective part) or refund the price of such Goods at the pro rata contract rate provided that, if Educonnect so requests, the Customer shall, at Educonnect’s expense, return the Goods or the part of such Goods which is defective to Educonnect. 11.6 If Educonnect complies with clause 11.5 it shall have no further liability for a breach of any of the warranties in clause 11.2 in respect of such Goods. 11.7 Where Educonnect is not the manufacturer of the Goods, the warranties in clause 11.2 shall not apply and Educonnect shall endeavour to transfer to the Customer the benefit of any warranty or guarantee given to Educonnect. 12.1.3 any representation, statement or tortious act or omission including negligence arising under or in connection with the Contract. 12.4.2 Educonnect shall not be liable to the Customer for any pure economic loss, loss of profit, loss of business, depletion of goodwill or otherwise, in each case whether direct, indirect or consequential, or any claims for consequential compensation whatsoever (howsoever caused) which arise out of or in connection with the Contract. 12.5 The Customer acknowledges that it has accepted these Terms in the knowledge that Educonnect must limit its liability and that the Price has been calculated accordingly. 13.1.10 the equivalent of any of the events described in clauses 13.1.2 to 13.1.9 inclusive under the law of any jurisdiction occurs in relation to the other party. 13.2.2 expressed or intended to continue in force after and despite expiry or termination. 13.3 The Customer shall not following the termination of the Contract for any reason represent itself as being connected with Educonnect or any member of Educonnect’s Group. 13.4 On termination of the Contract by Educonnect pursuant to clause 13.1, the Price and all other sums payable under the Contract shall become immediately payable. 14.1 In this clause 14, the expression “Confidential Information” means all technical, commercial and financial information, product information, trade secrets, know-how and all information relating to the plans, intentions, market opportunities, transactions, affairs and/or business of a party or any member of its Group and/or its or their customers and/or suppliers, and the existence and content of the Contract. 14.2 Each party shall keep secret and confidential all Confidential Information of the other and shall not (and shall procure that its employees, officers and agents shall not) copy, use or disclose any Confidential Information to any third party, other than as may be necessary to comply with its obligations under theContract. 14.3.5 is disclosed on a confidential basis for the purposes of obtaining professional advice. 14.4 This clause 14 shall continue in force notwithstanding the expiry or termination of the Contract, whatever the reason for such termination. 15.1 All intellectual property rights in reports and other deliverables created by Educonnect in the course of performing the Services shall belong to Educonnect. Educonnect Ltd hereby grants the Customer a licence to use the intellectual property rights in the deliverables to the extent necessary to make use of the deliverables as contemplated by the Order Form. 16.1 Time is not of the essence in relation to the performance of the obligations of Educonnect under the Contract. 16.2 All notices and other communications between the Customer and Educonnect relating to the Contract shall be in writing and shall either be delivered personally or sent by first class post or fax to the registered office of the other party or if it has no registered office, its principal place of business. Notices and other communications if delivered by hand shall be treated as received when delivered, if sent by first class post 48 hours after posting, if sent by air-mail post 72 hours after posting and if sent by fax when sent. 16.3 These Terms and the Order Form constitute the entire agreement between the Customer and Educonnect and replace all previous agreements between them relating to the same subject matter of the Contract. 16.4 Neither the Customer nor Educonnect shall be liable for any failure to perform or delay in performing any obligation under the Contract if the failure or delay is the result of circumstances which are beyond its reasonable control, provided that as soon as is reasonably practicable it gives notice to the other party. For these purposes, acts of omissions by the employees, sub-contractors, developers, agents and representatives of either party are within that party’s control. 16.5 Nothing in the Contract creates a partnership or employment relationship between the Customer and Educonnect or makes one party the agent of the other. 16.6 Neither Educonnect nor the Customer may assign or transfer the Contract or any rights or obligations under it without the prior written consent of the other (such consent not to be unreasonably withheld or delayed). 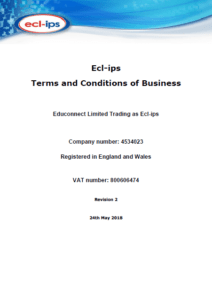 16.7 The Customer and Educonnect confirm that they do not intend any third party to have the right to enforce any provision of the Contract under the Contracts (Rights of Third Parties) Act 1999 or otherwise. 16.8 If any provision of the Contract is found under the laws of any jurisdiction to be invalid, illegal or unenforceable, it shall to the extent of such invalidity, illegality or enforceability be deemed severable and the remaining provisions of the Contract and the remainder of such provision shall continue in full force and effect. 16.10 All terms of the Contract which by their nature ought to survive termination will continue to be effective after the Contract has expired or been terminated. 16.11 The laws of England and Wales shall govern the Contract. The Customer and Educonnect agree to submit to the exclusive jurisdiction of the courts of England and Wales.